The Coast Guard's Cape Palmerston was pressed into service Saturday night to find two missing boaters. Elk Bay is located 30 km north of Campbell River on Discovery Passage. Two Campbell River men stranded on the shore after capsizing near Elk Bay had to ward off a prowling cougar while trying to attract attention from passing boats Saturday night. 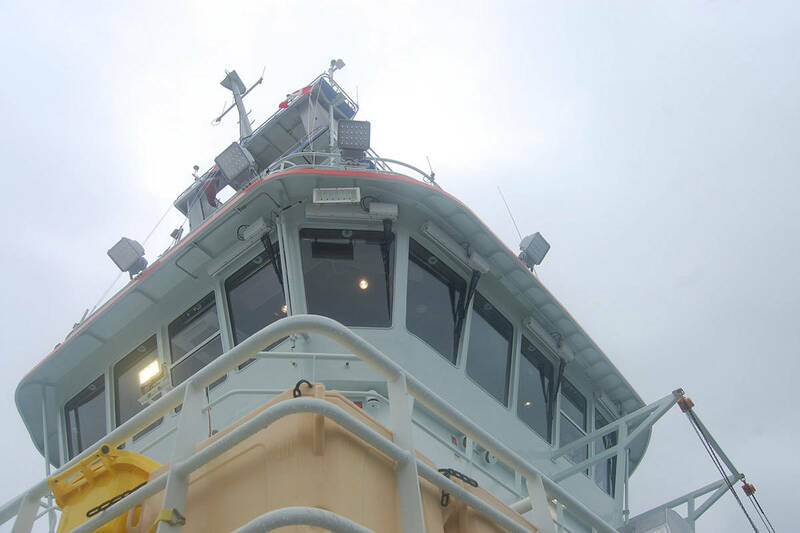 “A couple of guys were out doing some fishing in Elk Bay, there, and they ended up sinking their boat and had to swim for shore,” said Ron Boucher, Officer in Charge of the Canadian Coast Guard vessel Cape Palmerston which is based in Campbell River. The Cape Palmerston’s four-man crew set out at 1:50 a.m. Dec. 4 to search for the two men who were reported overdue. Tyler Shaw and Lorenzo Cockriel had gone to Elk Bay, 30 km north of Campbell River Saturday afternoon, to go fishing. After an afternoon on the water, at 4:30 p.m. they decided to head back to the boat ramp at Elk Bay where they had parked their truck. It was then Cockriel lost his balance in the boat and fell overboard. He tried to climb back into the 12 foot aluminum boat but accidentally flipped it. The boat sank in a matter of seconds, Shaw’s wife Sharrelle Foxcroft said. Boucher said the boat flipped about 500 metres offshore and the pair were not wearing lifejackets. Shaw was further hampered by his hunting jacket, jeans and boots which he removed in order to stay afloat. He then managed to grab a floating gas can which they shared and used to get them to shore. Once on shore, they walked up the rocky beach before their legs gave out from being so cold, Foxcroft said. The two men had to stop and huddle on the beach, sharing Cockriel’s jacket to ward off hypothermia. Once they stopped, however, they had to ward off more than just the cold. They soon drew the attention of a prowling cougar. They couldn’t stand up or move from being so cold so they grabbed driftwood and banged it on the rocks, keeping the cougar at bay for hours this way. Staying on the rock, they yelled for help all night, seeing boats pass by but being unable to attract their attention. Now long overdue, Shaw’s uncle Kenny Snowdon and mother Diane Snowdon set off in search around 10 p.m. and found the pair’s truck at Elk Bay. Despite finding the vehicle, the men could not be located and they were reported missing to the Coast Guard around 12:30 a.m. Sunday. The Cape Palmerston was on the water searching around 1:50 a.m.
After a while, unable to sit at home, Foxcroft and her father decided to join in the search which had also included Shaw’s brothers. Meanwhile, Boucher said the Cape Palmerston had set off for Elk Bay and had a lookout on board as well as the FLIR (Forward Looking Infra-Red) device. Around 3:30 a.m., the vessel’s lookout heard the men yelling and moments later the FLIR detected their heat signal. The Palmerston’s rubber boat was dispatched to rescue the pair off the rock. “They were pretty cold,” Boucher said. But they were in much better condition than Boucher said he would have expected them to be, given the circumstances. They were taken back to Campbell River and taken to hospital to be checked out. Just as Foxcroft and her father were fueling up his truck and getting coffee and join the search, she got a call at 4:30 a.m. from Diane Snowdon. Foxcroft returned home and got a phone call at 5 a.m. from Shaw. Foxcroft was thankful the incident ended positively.